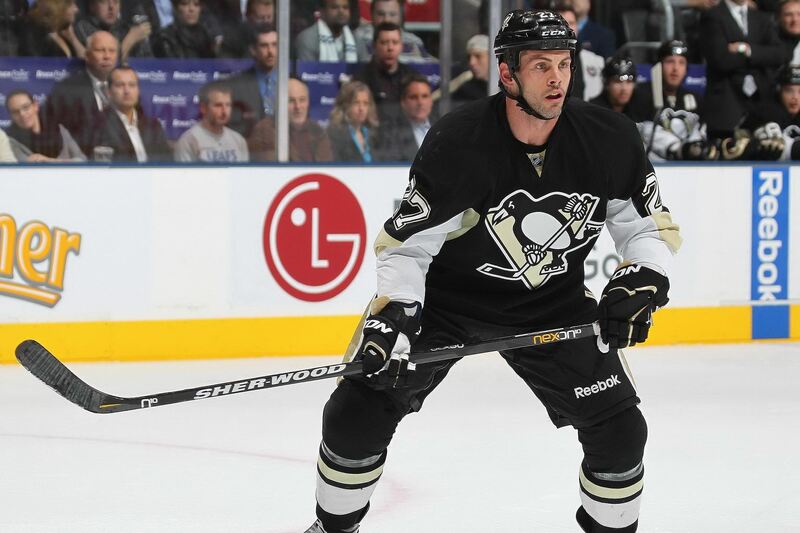 Craig Adams “Ironman” streak continues for Penguins…. The full article from the PG on Craig Adams’s ice hockey training and Ironman streak can be can be read below…. Craig Adams skates in a game against the Toronto Maple Leafs on February 1, 2012 at the Air Canada Centre in Toronto, Canada. The Leafs defeated the Penguins 1-0. Some things seem as if they never change. 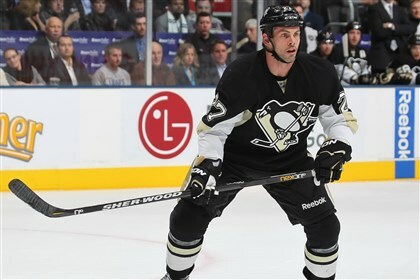 Craig Adams being in the Penguins lineup, for example. Other things don’t stay the same. For instance, Adams’ training regimen that has helped him put together an ironman streak that is expected to reach 263 games when the Penguins play tonight at Buffalo. “I would like to think that the training that you do from the beginning, however far back that goes, is part of your foundation, is part of what is able to keep you healthy,” said Adams, who often plays right wing on the fourth line, sometimes centers that line and occasionally sees some time on the third line. But he always plays, game after game, dating to Oct. 16, 2010, when he was a lineup scratch for a game against Philadelphia. His is the fourth-longest streak of consecutive games played in club history. “If you’re looking at guys on our team for taking care of themselves and being in shape, preparing, I don’t think you’re going to find one better than Craig, from his off-ice [training] in the summertime to what he does during the season,” coach Dan Bylsma said, adding that Adams devoted an extra 20 minutes on the ice after practice Tuesay to working on his game. Adams has some grit, ranking fourth on the team with 117 hits. He ranks first among the Penguins forwards with 45 blocked shots. He is one of the top penalty-killers on a team that ranks first in the NHL in penalty-killing at 87.7 percent. “He’s a card-holder for tough and determined grit on our team,” Bylsma said. One thing Adams is not, is a goal-scorer. He has three goals among his seven points this season, but those goals came in the first four games, and he has none in the past 52. The fact that the fourth line has not contributed heavily on offense is a factor on Adams’ team-worst plus-minus rating (minus-9). And a contributing factor to that is rampant personnel turnover on the fourth line. “With the injuries we’ve had, it hasn’t been very consistent,” Adams said. “I don’t think it helps. Adams, claimed off of waivers in March 2009, doesn’t care for excuses when it comes to training, either. While teammates Sidney Crosby and Kris Letang are better known for their extensive offseason workouts, Adams, 36, keeps himself in top shape with a workout routine that has evolved. So efficient that he is resilient and apparently has a high pain tolerance. “He’s played with injuries that keep other people out for weeks,” Bylsma said. “Two years ago, he had a knee injury, and we were playing Chicago the next day. We got the word from the doctors what his injury was. He said, ‘I’ll be fine. I’ll be able to play.’ And sure enough, he did. Adams has been a sponge around physical therapists, conditioning coaches, other players, and he incorporates bits of what he sees into his regimen. “There are trends,” he said. “I don’t like to swing too wildly in the direction of whatever is in fashion. Things come and go, but there are certain things that stay. Adams works with personal trainer Scott Umberger (cousin of R.J. Umberger of the Columbus Blue Jackets). They share an interest in always seeking new techniques and workouts. “He’s constantly evolving, trying to get better, more efficient, more specific, all those things,” Adams said. “It’s interesting. It will never end. You’ll never get to that point, no matter how old you are, where you say that this is the perfect, right way to train, the right way to do things. Until then, you know where you find Adams on Penguins game nights. Shelly Anderson: [email protected], 412-263-1721 and Twitter @pgshelly. ⟵Personal Training and Sports Performance Training interview #2 with Push Strength in Toronto.